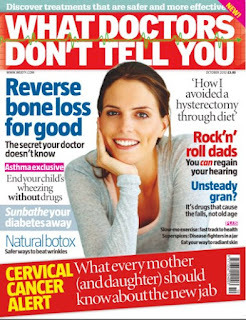 Since 1989 husband and wife team Lynne McTaggart and Bryan Hubbard have been running a website called What Doctors Don't Tell You. Now they are publishing a magazine with the same title. It wasn't easy finding a copy, which is a mercy. One newsagent in Camden told me he received an unsolicited batch yesterday and sent them straight back because he didn't like the look of them. Who are McTaggart and Hubbard? She has form as an anti-vaccination campaigner. In one of her books, The Intention Experiment, she says that the universe is connected by a vast quantum energy field and can be influenced by thought. He recommends vitamin C as a treatment for cancer and they complain about the Cancer Act which prevents them promoting their 'cures'. So I think we know what we're dealing with. There is a bit of common sense here - get some exercise, don't eat junk - but my main issue with WDDTY is that the average reader has no way to tell crap from Christmas and, for some of the articles, nor do I without reading every single research paper they mention to check all the trials and tests were randomized, placebo-controlled, double-blind, peer-reviewed and had sound methodology and good sample sizes. But I do know when I'm being obviously manipulated. I may not be a rodentologist but I can smell a rat a mile off. The main message of WDDTY is BE AFRAID. BE VERY AFRAID. Doctors misdiagnose, make mistakes in prescriptions, constantly break the law by treating patients like 'lumps of meat' and not discussing treatment options properly. If your doctor doesn't kill you, your dentist will by X-raying your teeth. Whipping up fear that a visit to the doctor might kill you is McTaggart and Hubbard's strong suit. Even worse, it might kill your children. This is the trump card as the main audience for magazines like this is women. Around 80% of the pictures of people in WTTDY are of women (I'm not sure about the dogs and the piglet). There's more. The antidepressants your doctor prescribes you will probably kill you. So will painkillers. Two thirds of people on prescription drugs end up in a worse state because of them. Cancer screening doesn't save lives. Sunblock causes diabetes. Prescription drugs 'are playing a big part in the mental and physical decline of the elderly, and may even be a contributor to premature death'. Note the 'probably' and the 'may even': there's a lot of that in WDDTY. It's one scare story after another. But there is some good news. Forget about medicine, don't go to the doctor, take supplements. Pretty much every article has a suggestion of a 'proven' alternative to medicine which is either dietary supplements or 'alternative' medicine. Oh, and homeopathy works! This has been proven by a Swiss study that relies on 'real-life' cases rather than academic studies, they say. There is a long list of superfoods too. Because they're natural. And natural is good. Unlike doctors and prescription medicines, which are unnatural and very very bad. WDDTY is big on food allergies too. There are lots of stories about various conditions caused by them. Perhaps this is because the magazine is 'supported by some of the world's leading pioneers in nutritional, environmental and alternative medicine'. Whatever is wrong with you, or whatever you fear you might get in the future, supplements will see you right. It's a bit like psychics who make a prediction then, if you say it hasn't happened, they tell you it soon will. In the same way that cigarettes are nicotine delivery systems, WDDTY is a supplement advert delivery system. There is a huge range of unscientific and anti-science propaganda here, all the usual cobblers that a proper scientist could spend weeks demolishing. There are also a couple of articles that are more worrying. The first is the case study of Nerissa Oden. She says 'I healed myself of severe dysplasia (abnormal cell growth) and HPV (human papillomavirus) in just six months'. How did she do this? 'A friend who is a chiropractor and nutritionist suggested I get tested for hidden food allergies'. Nerissa also went to a naturopath 'who recommended a list of vitamins and supplements that I should start taking'. Nerissa turned down a biopsy and a D&C (dilatation and curettage). After six months on the special diet, she got a good result on a Pap test but then fell off the diet wagon and got a bad result, so she went back on the diet for another six months and upped the supplements. Bingo. A Pap test came back normal and a gynaecologist declared her cured. At the end of the article is a handy list of 'helpful supplements'. There's a surprise. It's like a kind of cult. A cult of idiocy. Why is this worrying? It may cause women to self-diagnose, self-treat or turn down life-saving medical procedures. It will certainly cost them a lot because supplement manufacturers are not charities. It will put readers in the hands of unqualified, unregulated shysters. It may make them take an equally irrational and dangerous approach to other health issues and other areas of life. And if not them, then their children (see, I can play the kiddie card, too). 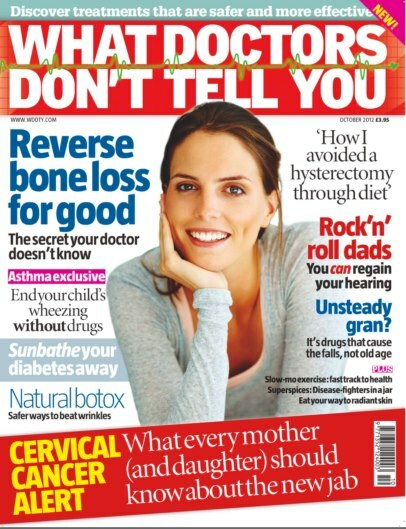 The second article, the longest one in the magazine, is about HPV vaccines. They are evil. Lynne and Brian don't seem to have read Nerissa's story where she lists all the cancers that HPV can cause and says how serious it is. Nor do they seem to know that the NHS and Cancer Research UK says that it's the second most common cancer in women under 35. In the editorial, they say it's not a serious issue and the article says it's 'uncommon'. But, given how inaccurate and unscientific the rest of the magazine is, why would this article be any different? The article, by McTaggart, says that cervical cancer is a third world problem, a 'disease of poverty and unhealthy living'. She talks about the huge number of side-effects but lists only the serious, scary ones. The article bombards the reader with statistics and 'facts' and ends by claiming that the vaccination will 'at best' save 40 lives in the UK while harming huge numbers. She accuses drug companies of using extreme scare tactics to promote the vaccines and make money - which is a bit rich when the magazine is shot through with scare stories to promote supplements and alt med. Incidentally, the supplement market was reported as worth 27 billion dollars in the US in 2009, and growing. I don't know if the vaccine is safe or not. I don't know if it's as effective as it claims. I don't know how many lives it will save. But I'm much more inclined to listen to the opinions of scientists than quacks peddling what I do know are unproven and potentially dangerous treatments. There's some common sense about the vaccine 'controversy' here. If this post has given you apoplexy, take a vitamin supplement and you'll be fine. I'm a doctor* and I'm most certainly not telling you to buy this magazine. *Not a medical doctor. I may start a magazine on all the things that humanities PhD doctors aren't telling you. "He recommends vitamin C as a treatment for cancer. " What is wrong with some people, unless the patient is terminal and they are doing it to raise patient morale, but still, what a con. Seriously, you have done us a favour here. I don't think I could read this magazine, not even for review purposes. The thing really would give me apoplexy. Then, of course, I would have to hit the vit C supplements. Wouldn't I? You utter wanker. Perhaps you should take the time to read some of the information in WDDTY before commencing with your knee-jerk reactions. If you're unable to use reasoned argument and evidence, what better way to put forward your views than to resort to simple abuse. Perhaps you should take some valerian to help you calm down. ^^What a charming fellow anonymous above is. I flicked through a copy that Martin Robbins had (which, come to think of it, might have belonged to this blog author!) and this post is far from a knee jerk reaction; there is some actively dangerous "advice" in it and any right thinking of even vaguely informed person should feel outraged upon seeing this garbage. Bloody hell, typo city there, sorry! David - but if you do get cancer, you can just cure it with vitamin C.